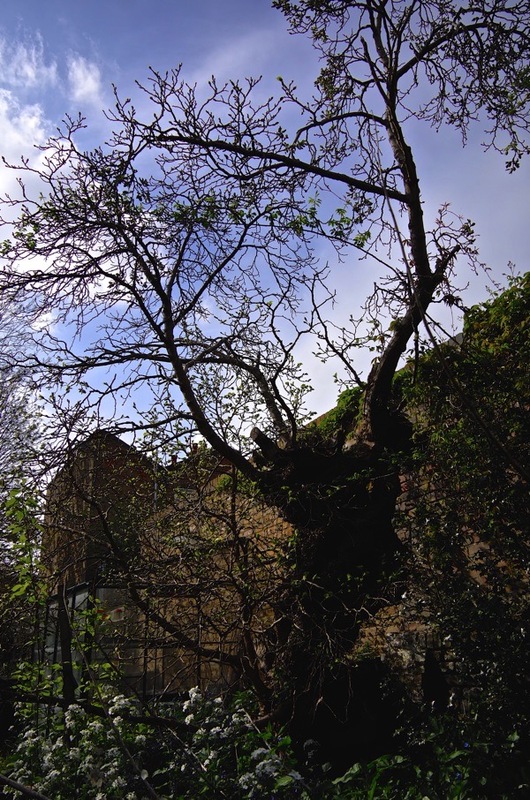 After I published my portrait of the four hundred year old Bethnal Green Mulberry yesterday, a reader invited me over to photograph the Haggerston Mulberry which has its own claim to longevity. I hopped on a bus up the Kingsland Rd as soon as I got the message and I was filled with wonder to be led into a hidden garden where this magnificent ancient specimen flourishes in a sheltered corner surrounded by protective walls. Its deeply-textured, gnarly bark was riven with the scars of innumerable branches gone long ago yet the old Mulberry had a healthy showing of new growth, heavy with buds unfolding into the fresh green leaves of spring. Like its relative in Bethnal Green, this tree produces a heavy crop of fruit each year. Liz, the fond custodian of the Haggerston Mulberry told me that within living memory there were once two other Mulberries close by but people took them down “because the birds dropped red berries and juice over your washing.” Older than all the buildings around, local lore has it that these trees were planted at the time of the arrival of the Huguenots. If readers know of any more ancient Mulberries in the East End please get in touch and I will come and photograph them. Dear Gentle Author, thanks for another fascinating post. Although it’s not in the east end, and is even south of the river (!) 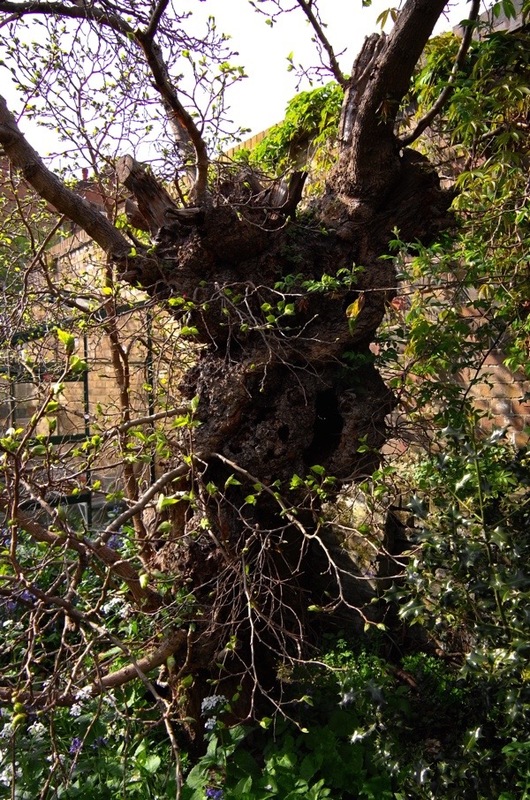 there is an ancient mulberry on the site of Sayes Court, the home of 17th century diarist John Evelyn. Some people, me included, like to think, in spite of the lack of evidence, that it’s a relic from Evelyn’s fabulous garden at Sayes Court. Glorious! Thanks for these fab old trees. We had one in our garden when living in Highbury New Park, N.5. At 3am one morning it crashed to the ground. Tree surgeons were called, but on arrival wanted to remove it! I told them that would be over my dead body, so they negotiated & it still produces fruit & lies at a lazy angle. Valentine’s Park apparently has lots that form ‘fairy rings’. Many, many years ago, whilst at school, Tower Hamlets School as it was the, Mulberry as it is now had a Mulberry Tree. I believe that when they decided to change the name. It’s present name was chosen. Not the east end, but there’s a lovely mulberry tree in the walled garden in Brockwell Park. Apparently the pink icing on Tottenham Cake was originally coloured by mulberry juice from the fruit of the tree in Tottenham Quaker Burial ground. I hope that you will get lots of responses GA as it would be lovely to have a photographic record of these venerable trees. I know it’s not the east End but Canonbury Tower has a mulberry tree in the garden said to have been planted during Sir Francis Bacon’s tenancy. 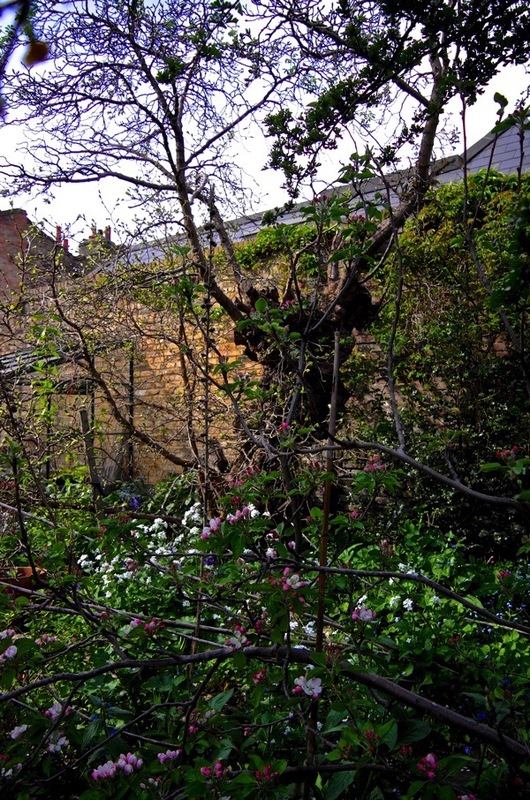 Gorgeous mulberry in Albiondrive in Hackney if you’re interested? I took a tour of the Charterhouse and they told us that most of the mulberries in London were planted by one of the Kings or nobleman who wanted to produce London silk. However they brought over the wrong kind. They planted black (dark red), instead of the white ones that silkworms like!